Verónica Gerber Bicecci, Empty Set, Trans. by Christina MacSweeney, Coffee House Press, 2018. How do you draw an affair? A family? Can a Venn diagram show the ways overlaps turn into absences, tree rings tell us what happens when mothers leave? Can we fall in love according to the hop skip of an acrostic? Empty Set is a novel of patterns, its young narrator's attempt at making sense of inevitable loss, tracing her way forward in loops, triangles, and broken lines. Verónica Gerber Bicecci is a visual artist who writes. In 2013 she was awarded the third Aura Estrada prize for literature. She is an editor with Tumbona Ediciones, a publishing cooperative with a catalogue that explores the intersections between literature and art. Bicecci’s experimental novel takes a unique approach to topics like debilitating loneliness, political repression, and epistemological crises. The narrator is Veronica, an aspiring visual artist, who lives with her brother in “the bunker,” a Mexico City apartment from which their mother, an exile who fled the Argentinian dictatorship, vanished when they were teenagers. Living in this “time capsule where everything is in a state of permanent neglect,” both siblings are “professional suspicionists” whose mother’s disappearance has affected the way they see the world: “Events always had a dark side, a shaded area we couldn’t make out, one that, despite being empty, always meant something more.” The novel whimsically chronicles Veronica’s various attempts to plumb these unknowable depths by studying tree rings, reading Stephen Hawking’s A Brief History of Time, and sifting through the papers of a deceased writer whose history mirrors her mother’s. In further efforts to decipher life’s mysteries, she also represents her familial and romantic relationships as Venn diagrams, which (among other illustrations) are reproduced in the text: “Visualized this way, ‘from above,’ the world reveals relationships and functions that are not completely obvious.” The graphics may strike readers as more gimmicky than revelatory, but nonetheless Bicecci has created a charming, elliptical novel. Set in Mexico and Argentina, Bicecci's debut novel concerns itself with time, disappearance, Venn diagrams, and the circularity of the universe. Just before Veronica's 15th birthday, her mother disappears, leaving the girl and her brother with an "interminable absence" for which "there's no recognizable cause....Only a series of scattered, meaningless clues. A set emptying out little by little. Disordered fragments." Time in this novel, for both the narrator, Veronica, and the reader, moves disjointedly, in fits and starts. Characters and events are introduced out of order, and the text is broken by line drawings, diagrams, and blank spaces. Tenuously holding these fragments together are Veronica's romantic struggles and her ongoing search for understanding and connection. After a failed love affair, she returns to her mother's apartment ("the bunker"), where she attempts to fix a sagging wall with plywood, tracing the growth rings in paint and meditating on dendrochronology: "each wood shaving contains discontinuous moments from the life of the tree." Beyond the details of past and present human relationships, the political hangs like a shadow. Veronica takes a job organizing the effects of a deceased writer who, like her parents, fled Argentina for Mexico in the 1970s; the task makes her feel divided between parallel universes in which she coexists with the absence of her mother and the late author of Exile. For the writer, Veronica realizes, the places she "needs to return to no longer exist, and that is the root of her tragedy...the consequences of dictatorship are felt afterwards, long afterwards." In a documentary she watches with her brother, people in the Atacama Desert search for the remains of those "disappeared" by the government. Her mother's own disappearance remains mysterious. "Love confirms the circularity of the universe," the writer's lover claims in a telegram, and the ending plays with this idea. THE OTHER DAY, I had a long, heated conversation with my son and a friend of his, both of whom are in their early 20s. My son is a painter, his friend is a writer, and the conversation was about the current state (and fate) of narrative. They are both ambitious; they work hard, range widely, get excited about all sorts of things, but their overall mood was pessimistic, disappointed, sometimes angry. They’re overwhelmed by the fragmentary nature of experience, their inability (anyone’s ability) to order it into a meaningful whole. They despair at the way narratives are snatched up and rendered meaningless by their commodification in a voracious, fast-moving market. They wonder whether it’s possible — and, if so, how — to create narratives that transcend this onerous situation. I see their point. It’s a stressful time. Attention spans are short. Narrative can seem irrelevant. And it’s hard to be young and ambitious, difficult to gather the bulk and speed necessary to begin your life’s work in earnest. But within my own, more tempered pessimism, I am guardedly optimistic. My experience in the classroom, where I teach writing to undergraduates, has made it clear to me that people still need stories, maybe more than before. I have faith in the basics — character, plot, setting, dramatic tension — at least as a starting point. And I’m heartened by narrative’s seemingly infinite ability to reinvent itself in response to ever-changing realities. As my son and his friend dug in, shooting down my arguments, I offered them some concrete examples — the rise of memoir alongside the yuppie uniformity of the 1980s, the evolution of the fragmented narrative to capture an increasing plurality of identities within cultures and individuals in the aughts — and they acknowledged the narrative vitality of rap and hip-hop, reciting some blisteringly smart lyrics as proof. But they were unconvinced. I would have left it there, a typical rift between generations, but I’m a mother, and mothers like to solve problems — they like to make things right. “Have faith. Tell your stories!” I encouraged them. “Don’t get caught up in the negativity.” But I began to doubt myself as our conversation limped to its unsatisfying conclusion. Who was I to be so optimistic? Maybe they were right. Enter Empty Set, a short novel by a promising young Mexican writer named Verónica Gerber Bicecci that was just published in English by Coffee House Press. A smart story of love and loss with a clever mix of narrative techniques, Empty Set may be an antidote to the current climate of despair. Empty Set tells the story of Verónica, a 22-year-old Mexican woman who is trying to get over a guy named Tordo, an older man who seems to have been her first serious boyfriend. Adrift, she moves back to her mother’s apartment, a disorderly place nicknamed “the bunker,” where she grapples with her mother’s mysterious disappearance seven years before and the painful solitude she and her brother faced in their mother’s absence. The story takes place in Mexico City, Argentina, and (briefly) Brooklyn. There’s a cat; a German hookup; some friends at UNAM, Mexico’s prestigious state university; a promising new relationship with a graduate student named Alonso; and a loving brother (in a few quick scenes, Gerber Bicecci captures the lingering closeness of siblings who have grown up and gone their separate ways). While she is holed up in the bunker trying to recover her equilibrium, Verónica spends a lot of time painting the swirling rings on the plywood she buys to shore up a wall in the apartment that is collapsing from humidity, contemplating, as she does so, the elusive nature of time (Gerber Bicecci’s parents are Argentinian, and like many writers in this tradition, she is interested in time and the melancholy that results from the recognition of its passing). Short on cash, Verónica finds a job archiving the belongings of Alonso’s recently deceased mother who, like Verónica’s parents, fled the dictatorship in Argentina for Mexico City in the 1970s. In her art, Gerber Bicecci sometimes uses set theory to explore human relationships. In mathematics (and philosophy), a set is a collection of objects or elements. Sets can intersect with other sets (as in a Venn diagram), unite with other sets, or be subsets of a larger set. In Empty Set, Gerber Bicecci uses drawings of sets to visually represent what her characters are going through at particular moments in the story. Sometimes they are alone, sometimes they intersect or merge with others, and sometimes, most importantly for the themes of love and loss in this story, they have lost a part of themselves to a failed relationship (with lovers, mothers) and don’t know what to do about it. At first, these drawings may seem like an intellectual exercise, which, in part, they are, but they fulfill several functions in the novel. They help us keep the plot lines straight. They help us sort the characters into sets: siblings, students, Argentinians, men who sleep with Verónica. And the drawings, which are warm and witty, little characters in and of themselves, help us visualize loss and the ways that people deal with it. But Empty Set isn’t just about these characters and their relationships. It’s about loss on a more abstract level — loss of place, loss of continuity, the inestimable losses that happen when people’s lives are uprooted by political crisis. Verónica’s parents are Argentinian, refugees from the 1976–1983 military dictatorship, and on some level the book is about the far-ranging effects of Argentina’s Dirty War. During the dictatorship, upward of 30,000 people, many of them students, were jailed, tortured, and “disappeared” by the military. Gerber Bicecci’s Argentinian characters weren’t disappeared in the political sense — they escaped to Mexico — but none are present in the story. Verónica’s father is absent — out of neglect or an unwillingness to face reality — and her mother has either “rubb[ed] herself out,” gone to the ends of the earth to find love, become a ghost haunting the apartment, or succumbed to mental illness, it’s never clear which. Alonso’s mother, another refugee, is dead and was, in life, a shadow of what she might have been. There’s a moving set of scenes that take place in Argentina toward the end of the novel that reveals yet another side to this loss. Verónica and her brother have gone to visit their grandmother, an elderly widow who lives, like Verónica and her brother and mother in the bunker, in a chronic state of disorder. A blocked-off staircase in her living room leads to an unbuilt second floor, where Verónica and her brother would have lived had their parents not fled the country — a potent symbol of tragedy in a place like Argentina, where family is everything. Verónica is distressed by this: “We never lived in that house they never finished building, to which they never added a second floor. Never, never, never. Three times never.” As usual, though, Gerber Bicecci offsets her deeper themes with a wry, familial humor that makes the family’s absence from Argentina more devastating: her grandmother’s refrigerator “is a cemetery of mate bags” (mate is a bitter South American tea). The house, her brother cracks, is the “Southern Cone branch office” of the bunker. Seeing Verónica and her brother in Argentina, however briefly, we understand what might have been. dictatorship makes no sense, because its aim is, for the most part, dispersal: separation, scattering, disunity, disappearance. Maybe what worried them was that children would learn from an early age to form communities, to reflect collectively, to discover the contradictions of language, of the system. Empty Set isn’t a graphic novel. Words predominate, and images, while important, are intermittent, not organizational. But the novel has a youthful tone that I associate, for some reason, with even the most serious graphic novels, an uplifting (if bittersweet) tone that fits the story perfectly. The ending shouldn’t come as a surprise, but, to Gerber Bicecci’s credit, it does. Suspicious of narrative at the beginning of the story, hiding behind her puzzles and her diagrams, Verónica gradually finds a place within it, a way forward that offers readers an enticing model for how to exist in a fragmented world of ever-multiplying identities. And the way Gerber Bicecci achieves this — an old-school plot within a boldly confident fragmentary structure made conceptual by the inspired use of images — is exactly what I meant when I was trying to convince my son and his friend of the power of narrative ingenuity. You’re not like you used to be. I understand MacSweeney’s decision conceptually. And her explanation, in the book’s afterword, offers a welcome look at the difficult work of translation. But since it’s customary in English to use personal pronouns and Gerber Bicecci’s prose, despite the book’s fragmentary structure, is not experimental in Spanish, it makes the book difficult, at times, to read. Latin American literature has long been dominated by men. Lately, though, there’s been a flourishing of female writers in Latin America, especially in Mexico and Argentina, and it’s good to see American publishers like Coffee House Press taking note of them — writers such as Guadalupe Nettel, Laia Jufresa, and Valeria Luiselli in Mexico; Samanta Schweblin, Leila Guerriero, and Pola Oloixarac in Argentina; and Lina Meruane in Chile. Hip, global, sometimes experimental, many of these writers seem to have leapfrogged over issues of gender and female identity that have preoccupied previous generations (and some of their contemporaries in the North), resulting in another kind of narrative ingenuity. Like the young women in Empty Set, their characters study, think, work, explore. They love (and lose) like anyone. In Verónica Gerber Bicecci’s novel Empty Set, the book’s narrator, an authorial stand-in also named Verónica, is haunted by her mother’s disappearance back when she was fifteen. In the book’s slightly fantastical world, this disappearance is gradual, ghostly: One day, Verónica and her brother noticed that it was increasingly difficult to understand what their mother was saying. She began to literally fade away and “in the end, we couldn’t see her anymore.” Years after the disappearance, Veronica and her brother still glimpse (or think they glimpse) phantom-like images of their mom around the apartment. The question of disappearance hangs heavily over Verónica’s story. In 1976, years before Verónica was born, her parents fled to Mexico from Argentina, which was then ruled by a regime that regularly disappeared its citizens. Although Empty Set is at times a playful, often funny work, the book becomes increasingly concerned with Veronica’s efforts to uncover her ancestral legacy, which seemingly disappeared along with her mother. After returning home, Verónica finds work organizing the archives of Marisa Chubut, a late Argentinian writer who also fled the dictatorship for Mexico, and plans a trip back to the country with her brother. The Venn diagram is of particular use to Verónica. “Through them,” she explains, “you can see the world ‘from above.’” But their aerial perspective is not the only reason Verónica is drawn to them: the diagram and logic system it comes from also have significant political implications. 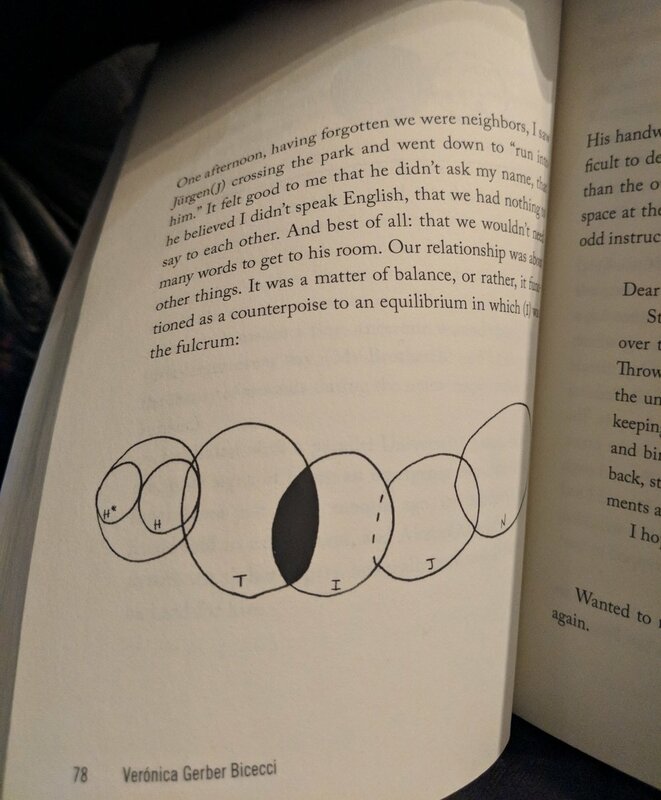 Under the military dictatorship in Argentina, it was prohibited to teach set theory or use Venn diagrams in schools. Speculating on the reasons for this ban, she notes that set theory allows people to group together in communities based on common interests. “From the perspective of sets, dictatorship makes no sense, because its aim is, for the most part, dispersal: separation, scattering, disunity, disappearance,” she writes. “Maybe what worried them was that children would learn from an early age to form communities, to reflect collectively.” If this anti-communal directive led to the separation and scattering of her own family, along with the disappearance of thousands of other citizens, then Verónica will return to this logic in order to achieve some form of unity in her own life. A seemingly endless number of identical hand-written copies of Exile,Marisa’s only book, in increasingly illegible handwriting mark the writer’s disintegrating mental state. A stash of photographs with the figures cut out seems ominous until Verónica discovers a collage made from the cut-outs, a way of reclaiming those lost to history, a means of making those “absent characters coexist.” As Verónica delves into the archive, she continues to sort out her position in the world with a series of increasingly complex diagrams that come more and more to illustrate a correspondence between two parallel planes: one representing her day-to-day world and the other the historical wormhole that she enters through her work in Marisa’s archive. Part family history, part lost love story, and mostly memoirish novel, Verónica Gerber Bicecci’s experiment with fragmented narrative augmented by illustration is not entirely successful but is quite engaging in many ways. The first-person narrator, Verónica, begins with her love life and loss, employing mathematical-style parenthetical notation at the end of names: Tordo (T), Mom (M). This oddity becomes less so as she begins to use this alphabetic shorthand in the diagrams she employs to illustrate the complex and sometimes not so complex interactions among the characters. As a result, she provides an emphatic reassertion of certain prose points in graphic form. There are also several elusive characters who make appearances throughout the novel. After Tordo (T) leaves her, Verónica is hired to archive the papers of Marisa (Mx), the mother of Alonso (A). She is intrigued and somewhat smitten by him, but he, too, turns out to be hard to pin down. And her task of archiving turns into a tale of detection, trying to find the truth of the mysterious Marisa. The novel, which was released in English by Coffee House Press on Feb. 6, is about a 22-year-old woman living in Mexico named Verónica. The story takes place as she’s caught between the breakup of one relationship and the false start of another. The relationship at the center of the story, however, is between Verónica and her mother, who vanished years ago when the family was living in Argentina. The largely unspoken assumption is that the mother was "disappeared" by the government during the Civic-Military Dictatorship of Argentina. The repercussions of this loss weigh heavily on the lives of both Verónica and her brother. As Verónica tries to start new relationships and eventually visits her childhood home in Argentina, her mother is physically gone but emotionally present. Ms. Gerber Biecci self-identifies as a visual artist who writes and that makes a lot of sense for the person that would eventually write Empty Set. That said, Empty Set works as a novel that her art background elevates tremendously. A rough approximation of the novel's plot: the narrator, an Argentinean woman named Verónica, is imprisoned by stuck-in-a-cycle living and under-employment, and begins to make her way out of depression. I'm not sure to what extent the fiction is true to Ms. Gerber Biecci's life. The diagrams allow the book to show and not tell in two different mediums, which helps the work hit the desired notes better. As far as I know, this approach is not entirely unique. In a completely different medium (Western comics), Johnathan Hickman enjoyed significant (perhaps life-changing?) success by letting stylized charts and diagrams carry flavor or information in his comics. But what separates Empty Set is the visual repetition of images, which reveal more and more layers the deeper I read through the book and Ms. Gerber Biecci's execution. One of the repeating images that sticks with me is the tree rings, though given what happens further in the book, these could also represent a downward spiral. I enjoyed how Verónica's side-job organizing a dead woman's belongings is a neat metaphor for tree rings, while also introducing another part of the book: the establishment of a new cycle to ensnare Verónica. Verónica dreams of reordering time. Living in a Mexico City apartment with her brother, she envisions “the past in a future so distant we never reach the moment of confronting it.” Though she shares “the bunker” with her sibling, she is still isolated and alone, trying to find a job and dealing with the disappearance of her mother. Empty Set, Verónica Gerber Bicecci’s novel, charts and diagrams Verónica’s solitary path. Told in fragments, a number of things happen: Verónica breaks up with her visual artist boyfriend, who had a tattoo of himself pictured from far away, walking on a high wire; she is hired to organize the correspondence and writings of a deceased female author, and becomes interested in her son; she travels to New York, and to Argentina, where her mother was born; and she mathematically muses on the interactions and organizations of her life and the lives of those around her. Many of these events overlap, metaphorically and literally: for example, the frustrated female author whose work and correspondence Verónica collates shares a background with Verónica’s own mother, as both were refugees from Pinochet dictatorship; and her trips north and south raise similar feelings of loneliness. Characters appear and reappear—or perhaps, it seems, they may have just disappeared. We always realize things afterwards. Loneliness is invisible, we go through it unconsciously, without knowing it. At least that’s true of the sort that I am talking about, it’s a kind of empty set that installs itself in the body, in language, and makes us unintelligible. Gerber Bicecci’s writing is both existential (“We’re all waiting for what we can’t see to finally appear”) and sharply observational (one character “had a sad expression, but he laughed at anything and everything”). Christina MacSweeney’s translation ably renders Gerber Bicecci’s isolation, which in this particular case was complicated by a unique issue in her style. Addressing this, novel contains an afterward about “The I Problem,” which involved whether to use brackets—each character in the novel has an attaching symbol, such as “Mother[M] or “Tordo[T]”—when the novelist uses the word “I.” (Of course, in Spanish, it is possible, grammatically, to omit “Yo” altogether, but not quite in English.) Obviously thought through, the translator’s omission of “I” as much as possible in this translation underscores Verónica’s lack of self, perhaps a product of her mother’s disappearance. MacSweeney’s experience with these types of fragmentary novels shows; she also translated Valeria Luiselli’s wonderfully outré The Story of My Teeth. 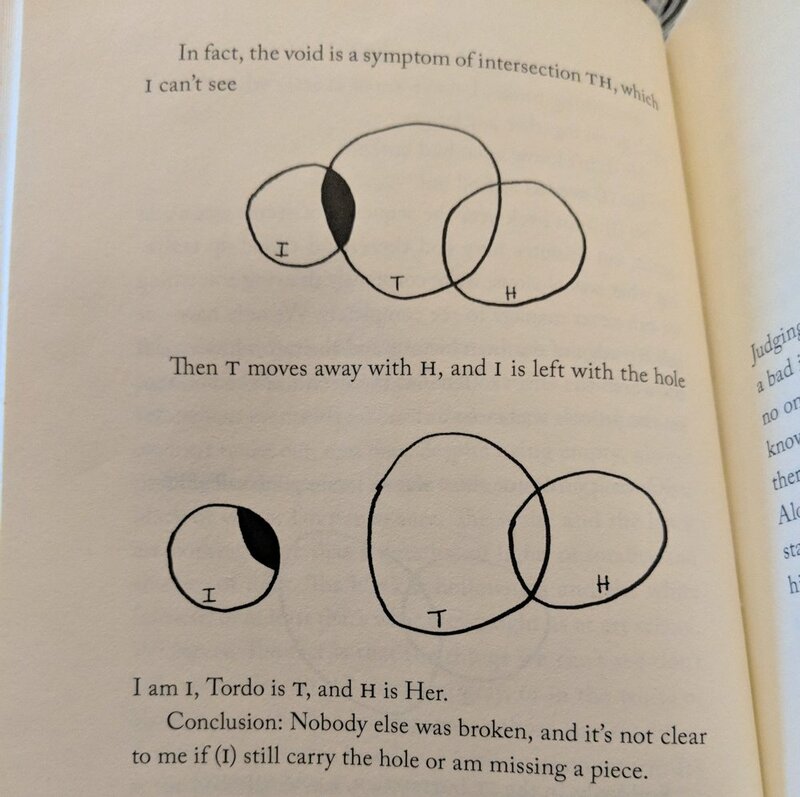 Equally important to all of the words, however, are the illustrations and diagrams in Empty Set—including figures and representations of the characters in diagram form. As described on her website, Bicecci is an “artista que escribe,” or an “artist who writes”—the order being essential (somewhat similarly, Verónica’s ex-boyfriend is described as visual artist who would have preferred to be a writer). It’s natural that with Empty Set, she has created a hybrid of two art forms: the book is littered with figures mapping the interconnections of the characters and demonstrating things the written word cannot quite detail. What could have been gimmicky isn’t, as the visuals are a fundamental part of the storytelling, and essential to its deeper layers. (A few times they are also funny.) About a third of the way through the novel, in fact, there is a rather complicated series of what best can be described as Venn diagrams—some shaded or partially shaded, some with dotted lines and some with solid lines—each representing various characters in the book, accompanied by the text, “Here’s where this story ends.” Of course, the order of what happens in this novel is only part of the puzzle the reader has to assemble, but this layer makes for the sort of fun one has trying to work out a Rubik’s Cube. VGB: I think so. In this case it ended up being a sort of visual poem. I hope it works well!G: One of my favorite lines from the book was “We were two strangers helping each other cross the street.” The line reminded me about how books help us survive the darkness. What books and art have helped you to “cross the street”?